So you have decided which furniture is the perfect addition to your home...but now there is one final decision to make! Whether your furniture is oak, cherry, walnut, or quarter sawn oak, we have many different colors of stains from which to choose. 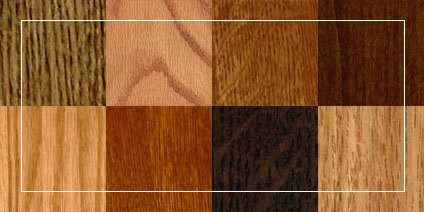 Below you can see samples of our stains on the cherry and oak woods. Do keep in mind that because of variations in computer monitors, these are only approximate color matches. Come in to Heritage Amish Furniture to see real life samples of all our stains.